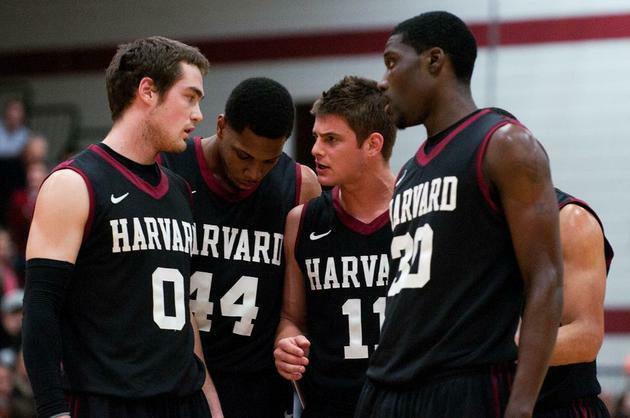 Meredith H. Keffer From left, sophomore Laurent Rivard, seniors Keith Wright and Oliver McNally, and junior forward Kyle Casey have helped bring about a men's basketball renaissance at Harvard. The story of how the Harvard men's basketball team reached Tuesday's milestone involves far more than just a 19-man roster that went 26-4 during its regular season. On the night of March 5, 2011, 400 Harvard undergraduates gathered in a cramped, aging building on the far side of the Charles River. They cheered and chanted, and they believed their team would win. And indeed it did, as the Crimson defeated Princeton to win a share of its first-ever Ivy League championship. One year later, the Harvard men’s basketball team managed to pull it off again. Penn’s 62-52 loss to Princeton Tuesday evening let the Crimson clinch the school’s first-ever outright Ivy title and send it to its first NCAA tournament since 1946. The story of how it reached that milestone—one that overcame 112 years of on-court mediocrity—involves far more than just a 19-man roster that went 26-4 during its regular season. It encompasses a coach in search of redemption, an athletic director determined to oversee the rebirth of one of the most maligned programs in college basketball, and an impassioned group of Harvard graduates with the resources to do something about it. Exactly five years before the ebullience of clinching its second consecutive Ivy title—which it did on Saturday at Cornell—the Harvard men’s basketball team was down and defeated on the final night of the 2006-07 regular season. That evening, the Crimson fell at Columbia, dropping its ninth conference game and bringing another disappointing season to an end. The 2006-07 campaign was like many others that the program had experienced—the Crimson’s 12-16 overall record marked the team’s fifth straight losing season. Harvard hadn’t been faring much better in conference play, either; the 2006-07 season marked the fifteenth time in then-head coach Frank Sullivan’s 16-year reign that the Crimson failed to finish with a winning record, extending Harvard’s Ivy League title drought. Despite its success in other sports, the Crimson was the only team in the Ancient Eight never to have won a basketball championship. Two days after the Crimson’s season-ending loss to the Lions in 2007, the Harvard athletic department announced it was making a change: Sullivan, at the time the longest-tenured coach in Harvard basketball history, was being let go. That decision set in motion a series of events that would lead to the emergence of the Harvard men’s basketball program on the national stage. Eight hundred miles west, the University of Michigan men’s basketball program was experiencing similar feelings of disappointment. Heading into the 2006-07 season, expectations were high for the Wolverines. Michigan’s coach, 41-year-old Tommy Amaker, was entering his sixth season at the helm and had assembled a talented roster led by seniors Courtney Sims and Dion Harris that appeared primed to take the Wolverines back to the NCAA tournament for the first time since 1998. But after jumping out to a 14-3 start, the Wolverines faltered midway through conference play and were forced to settle for a spot in the National Invitational Tournament, where they were bounced by Florida State in the second round. On March 17, two days after the loss, the University of Michigan announced it was letting Amaker go. And just like that, Amaker was in search of a new job. Back in Cambridge, the Harvard Department of Athletics, led by Athletic Director Robert L. Scalise, was setting the stage for an extensive coaching search by meeting with alumni to garner support. For a program that had experienced so much mediocrity, Scalise had a grand vision of success. And a crucial step in reaching that goal was finding the right person to lead the charge. Before he could realistically go after top-tier coaching candidates, Scalise, who declined to comment for this story, sought a financial commitment from the program’s boosters to make the Crimson’s financial offer competitive with other Ivy League and upper-level programs. According to Tom G. Stemberg ’71, the honorary chairman of the Friends of Harvard Basketball, the Crimson had been paying Sullivan well below the average Ivy League coaching salary. Scalise approached Stemberg and other members about raising money to fund a salary increase to make the Harvard position competitive with other positions in the Ivy League. But according to Stemberg, it is practice that no Harvard coach can make more than a University Professor, effectively setting a cap on Amaker’s salary. Led by Stemberg, Scarpa, Thomas W. Mannix ’81, Joseph D. Carrabino ’84, and Fred Schernecker ’89, the Friends of Harvard Basketball called on former players to commit to supporting the program. With the support in place, the search committee—which, according to Mannix, was composed of Scalise, Harvard football coach Tim Murphy, then-Assistant Director of Athletics Pat Miller, Scarpa, and himself—began its pursuit of top-tier coaching candidates. Although the committee began sifting through candidates immediately after Sullivan’s dismissal, Amaker did not emerge on its radar until late in the search, after he was fired from Michigan. But it did not take long for him to become the clear frontrunner. According to Mannix, the fact that Amaker is African-American added to his appeal. Twenty-three days after Sullivan was let go, The Boston Globe ran a piece noting that Harvard did not have a single African-American among the athletic department’s 32 varsity head coaches and 13 senior administrators. “Tommy’s all of the above, and on top of that, Tommy’s just passionate about the game and bringing the level of integrity, talent, and recognition to the program that we only dreamed of,” he adds. Among the handful of coaches interviewed for the job, the decision came down to Amaker and Mike Jarvis, another big-name African-American coach who had been fired from St. John’s in 2003 despite leading the Red Storm to the Elite Eight in 1999 and the Big East tournament championship a year later. For some members of the 2006-07 squad, the pedigree of the two finalists came as a surprise. “At that point, you had no idea whether [members of the search committee] were just out of their minds and shooting too high and there was no realistic chance of actually getting these people, or if they really felt like they could go after some of these guys like Coach Amaker and get them,” recalls Andrew R. Pusar ’09, who captained the Crimson during the 2008-09 season. But the committee’s seriousness became clear to Pusar when Jarvis and Amaker arrived on campus for interviews. “When they finally brought in Mike Jarvis and Coach Amaker, it opened our eyes to how big the athletic department’s eyes were and what their objectives were,” Pusar says. Jarvis and Amaker met with the team individually, and it quickly became clear that Amaker was the top choice. According to Scarpa, the Friends were prepared to make a financial commitment to the former Michigan and Seton Hall coach. But a large part of Amaker’s hiring relied on a commitment from the administration as well. Amaker spoke with the admissions department to get a feel for the admissions standards for potential recruits, according to Scarpa. On April 9, 2007, Amaker was offered the job, and he accepted, signing a five-year contract two days later. The alumni were immediately excited by the new beginning Amaker provided. After he agreed to coach the program, one of Amaker’s first requests was to renovate the locker room, and with that came small changes to other aspects of Lavietes Pavilion, such as improving the coaches offices and installing new video and stereo equipment in the facilities. According to Schernecker, who played basketball at Harvard from 1985-89, alumni in the pre-Amaker era played less of a role in terms of supporting the program, with a few exceptions. With that precedent in mind, the Friends of Harvard Basketball began working after Amaker was hired, attempting to garner support for the new coach and his vision for the program. The Friends brought Amaker to Harvard Clubs in cities across the nation, including New York City, San Francisco, and Los Angeles. And the alumni responded exceptionally well to Amaker. And, just like that, a symbiotic relationship between Amaker and the alumni base was formed. Given an unprecedented level of support from the University, Amaker was ready to make good on the promises he had made on his tours across the country. But in his first season, the Crimson struggled mightily, opening the year with a 55-point loss at Stanford. Harvard went on to finish 8-22 and winless on the road. While the losses piled up, Amaker’s first campaign in Cambridge was quickly marred by controversy. On March 2, 2008, a day after the Crimson lost by 33 at Cornell to drop its record to 8-20, The New York Times reported on the front page of its Sunday sports section that Amaker had changed far more than simply the team’s offense since his arrival. The article by Pete Thamel, titled “In a New Era at Harvard, New Questions of Standards,” alleged multiple recruiting violations by the program. One of the piece’s most pointed accusations was leveled at Kenny Blakeney, who played at Duke in the early 1990s when Amaker was an assistant there and was hired as Amaker’s assistant coach when he came to Harvard. Blakeney reportedly traveled to Virginia to play pick-up basketball with then-high school seniors Maxim M. Kenyi and Keith A. Wright Jr. ’12 in the summer of 2007, during a period when in-person contact with coaches was not allowed. Harvard had announced the hiring of Blakeney on July 2, 2007, and Blakeney insisted that he had not been officially working for Harvard when he visited Kenyi and Wright, who both enrolled at Harvard a year later. But some did not feel that the accusations against Blakeney had been fully resolved. In July 2010, Harvard reported an unintentional secondary violation to the NCAA in connection with the summer 2007 incident and self-imposed recruiting limitations for the 2010-11 season. “Secondary violations” are defined by the NCAA as “inadvertent” and as providing at most a “minimal advantage” to the offending institution, said the league release, which also mentioned that the NCAA processes more than 2,000 secondary violations per year. The release stated that Harvard chose to acknowledge the violation due to an NCAA ruling that Blakeney’s conversations represented improper recruiting assistance to Harvard. Thamel’s story concluded with an anecdote concerning the recruitment of now-Penn captain Zack Rosen, who starred at St. Benedict’s Preparatory School in New Jersey for two years. Thamel wrote that Rosen’s father, Les Rosen, encountered Amaker in a Trenton grocery store in summer 2007 during a nearby basketball tournament. At that point in the recruiting calendar, coaches were restricted to greetings if they met prospects or their parents. But in a recent interview with The Crimson, the father of the Quakers star remembered the encounter very differently. Rosen added that he now considers Amaker a friend, and the two regularly chat after Harvard-Penn games. No punishment was ever applied by the league or the NCAA in relation to the incident, but Thamel was not yet finished tracking the actions of Amaker and his staff. Several months after publishing its initial story, The New York Times went on to report that Amaker had cut five players in early September. Thamel wrote that the move, which was made to allow room for Amaker’s first freshman class, was considered by many around the league to be in violation of the spirit of the Ancient Eight. A look back at the 2008-09 men’s basketball roster reveals seven freshmen and a total of six juniors and seniors—none of whom were brought in by Amaker—but no sophomores. Kyle B. Fitzgerald ’11, one of the three second-year players who was cut by Amaker, criticized the coach for not allowing former players the chance to compete for a playing spot as they had been promised in the spring of that year. The first batch of new recruits, for whom Fitzgerald and others were cut, has been one of Amaker’s most significant contributions to the Crimson. Amaker’s opening group, which included Wright, Kenyi, Oliver R. McNally ’12, and Andrew F. Van Nest ’12, was the first Ivy class ever to be ranked in the top 25 in the nation by ESPN. The strength of Amaker’s first crop of players came as no surprise given his history recruiting top players like future NBA All-Star Grant Hill, Eddie Griffin—considered by many to be the nation’s best prospect—and Ekpe Udoh—the future No. 6 overall pick in the NBA Draft—at Duke, Seton Hall, and Michigan, respectively. Amaker has not yet received the commitment of a Top-50 recruit at Harvard, but doing so is not out of the question. The coach has managed to quickly adjust to the particular demands of athletic recruiting in the Ivy League, which imposes stringent academic requirements and does not allow athletic scholarships. In examining a very small pool of students with both the academic and athletic skills to be accepted to Ancient Eight teams, Amaker and his staff have preached the message that Lavietes Pavilion is one of the only courts where players are offered the chance to contribute to something unprecedented. “Harvard’s very easy to sell. It almost sells itself,” adds former assistant Will Wade. Needless to say, plenty have bought into Amaker’s product. Prior to the 2008-09 season, Wade and company helped bring in a pair of three-star recruits in Van Nest and Kenyi, who received interest from Marquette, George Mason, and Holy Cross. Their rookie classmates also included eventual co-captains Wright and McNally, both two-star players. The next year’s class strengthened the foundation for the first Harvard squads ever to win a share of the Ivy League championship. In 2009, the team’s current juniors arrived, a group that included eventual all-Ivy players Kyle D. Casey ’13, Brandyn Curry ’13, and Christian Webster ’13, and reserves Demetrius A. Giger ’13 and Jeffrey M. Georgatos ’13. “We were competing with other high academic schools,” says Wade, who served as the recruiting coordinator for Amaker’s first two years. He points to Vanderbilt, Stanford, and William & Mary as colleges which lost players to Harvard. Wade departed for a post at Virginia Commonwealth University in April 2009, but Amaker has not missed a beat since, continuing to go after elite talent that normally may never have considered playing in the Ancient Eight. Former Oklahoma graduate assistant Yanni Hufnagel took over as recruiting coordinator, and he and fellow assistant coach Brian DeStefano have helped Amaker steal highly touted prospects away from not only Ivy rivals but also major-conference schools. Current freshmen Kenyatta A. Smith ’15 and Wesley S. Saunders ’15 held among them offers from Vanderbilt, Colorado, and USC, while breakout rookie E. Steve Moundou-Missi ’15 was named to the top 150 players in the nation by one analyst. Next year’s group of freshmen already includes Mike Hall—ESPN’s No. 19 center in the country—along with Agunwa Okolie, Siyani Chambers, and Evan Cummins. Having guided Harvard from mediocrity to a national ranking, Amaker and his staff are not holding back with members of the high school class of 2013; consensus top-100 players Davon Reed, Stephen Domingo, and Brannen Greene—who later committed to Kansas—visited campus in October. Along with high-level conference experience, Amaker was also fortunate to be hired shortly after significant changes were made to the school’s financial aid policy. In 2006, Harvard announced that families with incomes of $60,000 or less would not be expected to pay anything for their education and families earning between $60,000 and $180,000 would be expected to contribute no more than 10 percent of their income. Over the past several years, Amaker and his fellow Ivy coaches have benefited from further changes that often allow students to avoid loans, even without full-ride scholarships. He may have also been given advantages that his predecessors did not have. One of the 2008 New York Times article’s most damning allegations was that Harvard lowered its academic standards to improve the basketball program. For their part, Amaker and the Friends of Harvard Basketball deny the claim that the team’s Academic Index—a score ranging from 60 to 240 based on a combination of an applicant’s high school GPA and SAT scores that is used by Ivy League institutions to determine whether an applicant meets academic standards—has been changed. According to Stemberg, increased availability of financial aid, not any change in standards, played the biggest role in securing commitments from highly-touted recruits. “The change is financial aid. That’s the change. You look at the Academic Index—I haven’t checked this year—but the last few years, you look at the Academic Index of the recruited kids coming in, it is unchanged from the Sullivan years,” Stemberg says. But Thamel stands by his reporting. Dean of Admissions and Financial Aid William R. Fitzsimmons ’67 denies those claims. But even with the new financial aid program in place, Amaker has not always been able to get his top targets into Harvard uniforms. The player initially cited in The New York Times article as emblematic of Harvard’s altered academic attitude for basketball recruits was Frank Ben-Eze, who reportedly chose the Crimson over Marquette, Virginia, and West Virginia. But nine days later, Thamel reported that Ben-Eze had reopened his recruitment after being unable to reach the minimum Academic Index of 171. The 6’10” senior eventually went to Davidson, where he is currently preparing for the NCAA tournament. Howard committed to Maryland in Jan. 2010. There, he averaged six points and four assists per game before tearing his ACL in February. The league’s academic standards have only increased in rigor. Over the summer, the minimum Academic Index score required for prospective student athletes to gain admission to the Ivy League was adjusted from 171 to 176, according to Ivy League Executive Director Robin Harris. Announcement of the adjustment has led to speculation that the change will hurt the Ivy League’s ability to compete on the national level—particularly in sports such as men’s basketball, hockey, and lacrosse—because it will reduce the pool of high school athletes from which Ivy coaches can recruit. Boston College men’s basketball coach Steve Donahue, who served as head coach at Cornell from 2000 to 2010, said he anticipated the change since class rank was replaced by high school GPA in calculating the Academic Index. Harris said that admissions deans had noticed applicants were receiving higher scores on the Academic Index when it was calculated with GPA instead of class rank. Therefore, Harris said, a change in the minimum was necessary in order to maintain the Ivy League’s academic standards from past years. Like Harris, Donahue believes the change should not impact the competitiveness of Ivy League teams on the national level but stated that the occasional recruit who, in recent years, was admitted with an Academic Index calculated based on GPA while the floor was still at 171 might no longer be able to gain admission with the adjusted standard. One player hurt by the new policy may be current Harvard-Westlake High School senior Zena Edosomwan, whose final list is currently Harvard, UC Berkeley, USC, Wake Forest, Texas, Washington, and UCLA. ESPN’s tenth-ranked player in the Golden State, the 6’8” forward is waiting for his latest set of SAT scores to qualify him academically for the only Ivy League school he is considering, according to Harvard-Westlake coach Greg Hilliard. It remains to be seen whether Harvard will be the place for him. But more than just the Academic Index stands between Amaker and his highly sought-after prospects. Even with Harvard’s financial aid policy, many potential recruits have been unable to resist the temptation of a full scholarship. Four-star small forward Rod Odom Jr. included Harvard among his final choices and visited campus along with other top recruits Dwight Powell and Andre Hollins in fall 2009. The No. 66 player in the nation according to ESPN, Odom eliminated Harvard in October and first committed to Arizona but later switched to Vanderbilt, where he is now a sophomore. “The thing that prevented Harvard from being in the last two was when we got the financial aid indication, which—compared to a full scholarship—couldn’t be a consideration for us,” Odom Sr. says. Indeed, Amaker has not always prevailed against power-conference institutions, as other high schoolers have been attracted to Cambridge but ultimately chosen to go elsewhere due to personal preference. Center Dwight Powell, who was ranked in the top 100 by ESPN, made an official visit to Cambridge in Sept. 2009 but eventually committed to Stanford, where he is averaging eight points and five rebounds as a sophomore. Harvard was also in the final five of Andre Hollins, who was also considering Mississippi, Auburn, and Stanford. He visited campus at the same time as Powell, but the shooting guard chose to attend Minnesota instead. The freshman had 18 points in a loss to No. 15 Wisconsin last week. But the fact that the Crimson remained in consideration for such highly-touted recruits serves as an indicator of the progress that Amaker and his staff have made in just a few years. In a 2011 survey of more than 100 major Division I coaches, Hufnagel was dubbed the mid-major assistant most likely to make it big due to his recruiting ability. Yet, even without names like Powell, Hollins, or Dinwiddie on his roster, Amaker has delivered on his promises that his players would have the opportunity to make history. Harvard improved to .500 in Amaker’s second season, finishing 14-14 overall and 6-8 in conference play. The squad was led by emerging guard Jeremy Lin ’10, who had been recruited by Sullivan and earned a starting job under Amaker. The junior had 27 points in the Crimson’s Jan. 7 victory over then-No. 24 Boston College, which had won at No. 1 North Carolina just three days before. The win marked Harvard’s first-ever win over a ranked opponent and the Ivy League’s first over an ACC team in six years. One year later, led by Lin—a Cousy and Wooden Award finalist—and Casey, who won Ivy Rookie of the Year, the Crimson won 21 contests and finished 10-4 in the Ancient Eight. But after being blown out by Cornell in a contest then-deemed "the biggest game in Harvard basketball history," and losing its next game to Princeton despite a dramatic late comeback attempt, the squad finished third in the conference. That record earned the Crimson its first postseason invite since 1946, but it lost at Appalachian State in the first round of the CollegeInsider.com Postseason Tournament. In 2010-11, Harvard clinched a share of its first-ever Ivy title in program history. Led by Wright, who was named the Ivy League Player of the Year, the Crimson won a program-record 23 games. After losing its season opener at George Mason, Harvard won 15 of its next 17 contests and jumped out to a 10-1 start in conference play before falling, 70-69, at Yale, on a Curry miss at the buzzer. Back at Lavietes the following weekend, the Crimson had to sweep the Killer P’s to keep its tournament dreams alive. It easily topped Penn on Friday night, then on Saturday faced league-leading Princeton with the chance to clinch a share of its first-ever Ivy title in front of a celebrity-laden crowd. Casey's 24 points helped squad pull out a 79-67 win, which, combined with Princeton’s victory over Penn three days later, set up a one-game playoff with the Tigers the following Saturday for the right to go to the NCAA tournament. On the final play of the game, Princeton’s Doug Davis brought a swift end to the Crimson’s tournament hopes, sticking a mid-range jumper at the buzzer to give the Tigers a 63-62 win. The next day, Harvard learned it would have to wait at least another year for its first NCAA Big Dance berth in 65 years, as the squad’s RPI of 35 was the highest of any team not to be included in the 68-team field. Instead, the Crimson was sent to Stillwater, Okla. to face Oklahoma State in the National Invitation Tournament. The No. 6-seeded Crimson was blown out in the first round, ending its season. This year, Harvard finally got over the hump. The squad started its season 8-0, highlighted by a Thanksgiving championship in the Battle 4 Atlantis tournament in the Bahamas. Over a three-game stretch, the Crimson topped Utah, then-No. 22 Florida State, and Central Florida to take home its first-ever tournament title. On Dec. 5, Harvard earned its first-ever Top-25 ranking, appearing at No. 24 in the ESPN/USA Today Coaches Poll and No. 25 in the Associated Press poll. It stayed ranked for seven of the following eight weeks, finishing with a program-record 24 wins and its first-ever tournament berth. Indeed, things have certainly come a long way from the Sullvan era. On Feb. 25, the Crimson fell to Penn, 55-54, in front of a sold-out crowd of 2,195 at Lavietes. The frustrating loss brought an end to Harvard’s 28-game home-winning streak, snapping what was then the second-longest such run in the nation. Under Amaker, Harvard has had a great deal of success at its tiny home gym (of the 345 Division I men’s basketball programs in the nation, only 25 play in smaller-capacity venues), going 39-3 there over the past three seasons. But while Lavietes Pavilion has become an integral part of the Crimson’s success, there was a time not too long ago that it looked like Lavietes’ days as the home of the Harvard men’s basketball program might be coming to an end. Prior to the 2008 recession and the steep decline in the University’s endowment, the construction of a new basketball stadium in Allston was in consideration. “Before the stock market took that big dive it did and the endowment had that big struggle, there was a greater plan for all of those facilities on that side of the river to eventually be relocated,” Mannix says. Those plans, however, were put on hold with the bad economy. Today, the construction of a new stadium in Allston remains in discussion. New stadium or not, Stemberg says he thinks the Crimson can retain Amaker, who will likely be wooed by high-major programs after this season given the turnaround he has accomplished in Cambridge. After last season, Amaker was offered the head coaching job—and a significant pay raise—at the ACC’s University of Miami but decided to turn it down. Some members of the Friends of Harvard Basketball worry that the coach’s days with Harvard could come to an end if an attractive program extends a coaching offer. Katz thinks Amaker could not be happier at Harvard, where his wife, Stephanie Pinder-Amaker, is on the Harvard Medical School faculty. As long as he stays, Amaker should continue to attract top-level talent to Cambridge, and Lin’s success with the NBA’s New York Knicks this season will only help Amaker’s efforts. “With the Jeremy Lin press, it’s easier for [Amaker] to go to a kid and say, ‘Hey, if you have NBA aspirations, you can still get an education at the greatest school in the world and still fulfill your dream,’” Scarpa says. And the alumni who hired him five years ago are thrilled with the decision they made. Indeed, with the Crimson’s first NCAA tournament matchup since 1946 on the horizon, it appears that Tommy Amaker, the Friends of Harvard Basketball, and all those who have donned a Harvard uniform finally have a program that they are proud to call their own. —Staff writer Catherine E. Coppinger can be reached at ccoppinger@college.harvard.edu. —Staff writer Martin Kessler can be reached at martin.kessler@college.harvard.edu. —Staff writer Scott A. Sherman can be reached at ssherman13@college.harvard.edu.